I really love the NatureSnug diaper that I was sent to demo. As per the product page on their website, SmartSnugs offers these cute pocket diapers in a bunch of cute diapers, including one two-tone variety (which I had never seen before). For our lil' guy, we demo'd the blue dipe, which has a soft, flexible PUL shell and a super soft bamboo charcoal liner. 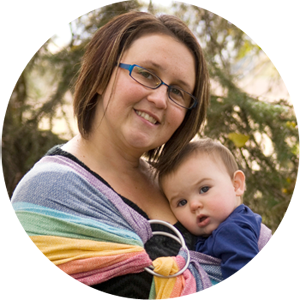 This OS diaper has an adjustable rise to fit most babies from newborn to potty training days. Also included with this sample diaper were two bamboo inserts, one smooth 5-layer one, and an extra 5-layer (textured) nighttime booster. 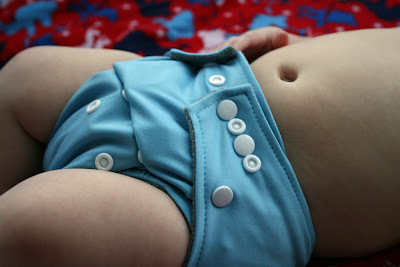 I was very excited to try the bamboo as my little dude not only has sensitive skin (bamboo is a great natural fiber for sensitive skin), but he is also a very heavy wetter, and we often don't get great absorbancy with some of our older, well-worn pocket diapers with flattened out microfiber inserts. As soon as I put this diaper on baby boy, I knew I loved the fit. It has the same snapping pattern as my other favorite pocket diapers in my stash: a square tab, crossover layout with a hip snap. 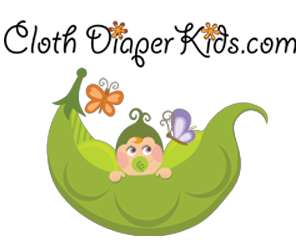 Unlike some of my cheaper diapers, this diaper also has fantastic flexibility and a little stretchiness to it, which means that when you pull the tabs to snap them on the waist, you get a terrific snug fit, with no gaps. The envelope-style opening for the insert stuffs from the back, and a flap keeps the insert from sticking out the back and wicking urine outside of the diaper. This diaper had terrific absorbancy for both short and long periods of wear, and this definitely has me thinking that I need to ditch some of my crusty old microfiber liners for these new bamboo ones! They have tremendous absorbancy, don't seem to get the same "stink" that microfiber inserts and boosters get, and they stay smooth out of the washing machine whereas microfiber ones seem to get a bit crusty and flattened, especially if they are line-dried. 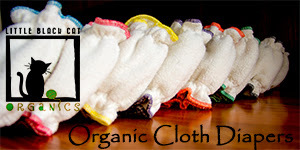 Overall, I totally love this diaper and would highly recommend it to anyone looking to start a new stash (or modernize a slightly crusty older stash like mine!). 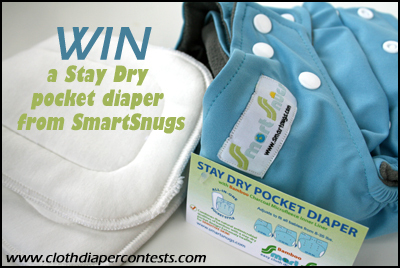 SmartSnugs is also graciously offering a free pocket diaper to one lucky reader, so be sure to get your Rafflecopter entries in down below!